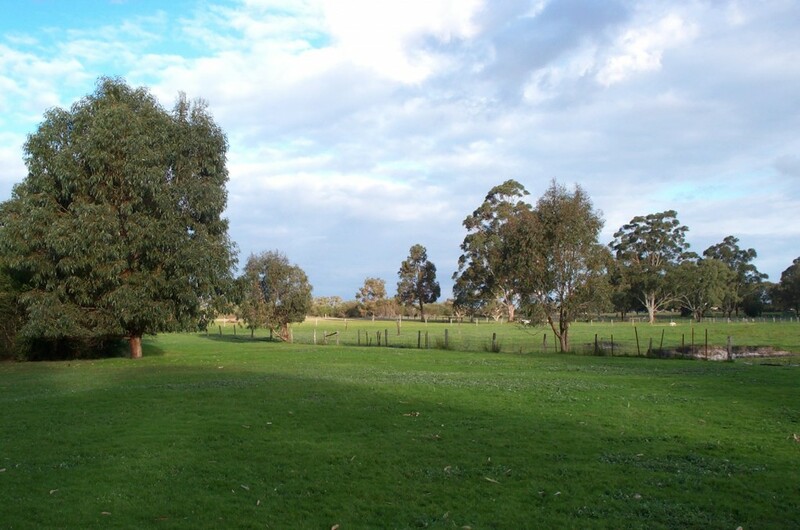 We first moved onto our 10 acres in the winter of 1991, with three of our children and two dogs. There was so much junk and rubbish left on the property and it had been neglected for years. The place was a quite a mess, but we got to work tidying, planting, building and acquiring animals. All the work then was really done by hand, with or without our long-suffering car as we could not afford a tractor. We did enlist the help of a flock of sheep and a few goats, who while they quickly ate down the wild grasses and weeds, also quickly showed us how bad the fences were! These were patched up with old wire (surreptitiously salvaged) from the dump or purchased from the auction at the local farmer’s market. ‘Dotty’ the goat we also tried milking her for a while after she had a kid, but she continually kicked! The sheep did well, though crutching and keeping the flies out of them in the spring was a chore. We got shearers in annually who were all great characters and story tellers- their payment was the wool. They would visit all the small farms in the area, save up enough for a bale, sell it and spend a day at the casino!! The car (in those days a Toyota Liteace) was well used and abused, from being overloaded with building materials to carrying a variety of animals including sheep, goats, and on one occasion a heifer! Later we got an old Dodge (Valiant) ute to do the carting and towing. 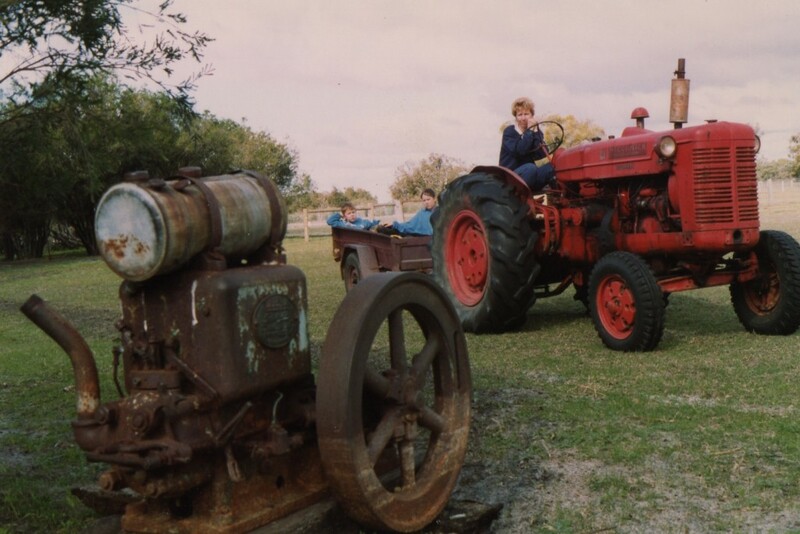 Eventually we tried a couple of old (hence cheap) tractors—first a very old Fordson Major, which we always had trouble starting and then this International. The ‘Inter’ was very reliable but had no implements. Here we are in the process of salvaging an old pump that irrigated the market garden opposite. Do we REALLY want that???? With no spare cash, first we used old second-hand chainsaws, a heavy-duty self-propelled mower and a professional brush-cutter retired from a local council, but still capable of some heavy-duty action. While all the other gear proved hard work starting and required more time fixing than doing actual work, the brush-cutter with its blades (instead of plastic line) was a great success in the thickets. There were a lot of swampland tussocks and reeds in the low lying ground too, especially in the paddock close to the house (the ‘swamp’ we called it, and the noise from the ‘pobblebonks’ or Banjo Frogs was deafening). In the winter it was covered knee-deep in water and the next paddock was just awash in the low parts. After watching it over a couple of seasons we decided to enlarge a small ‘dam’ (actually a soak that a previous owner had dug out) and use the sand removed to build up one of these low areas and provide a higher track through the swamp along the firebreak. What we reclaimed for use was balanced off by the increase in the area of the soak fourfold at least. Around this we planted reeds, trees and native shrubs. The reclaiming was very successful, though without a tractor the levelling of the sand was done by towing a heavy log behind a car! 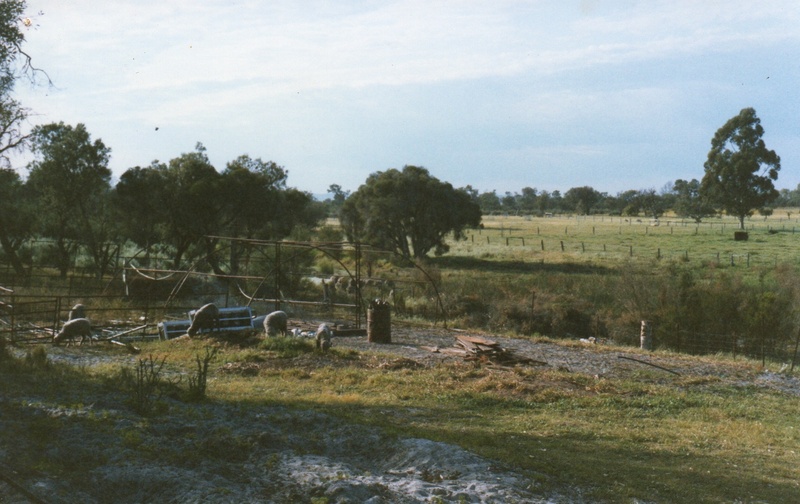 This soon became the ‘horse paddock’. The ‘swamp’ which was left at its natural level filled with water in winter and dried completely by the end of October, but remained green all through summer. The ‘old dam’, which in being artificially deepened retained water well into summer, later became a sanctuary. In these early years the pasture generally remained green all through summer, with the water table not far below the surface. Nowadays, with an increasingly dropping water table, it requires reticulation in summer. To keep water use down we have planted more trees which allow sunlight to cover the ground for a few hours each day but don’t let the ground get scorched. The ‘swamp’ has not had any water cover for years now and the frogs are all gone from it, and have moved closer to the house. We compensated for this in recent years by making many frog ponds and two large artificial lakes.